What Is The Best Crib Mattress For Your Baby? 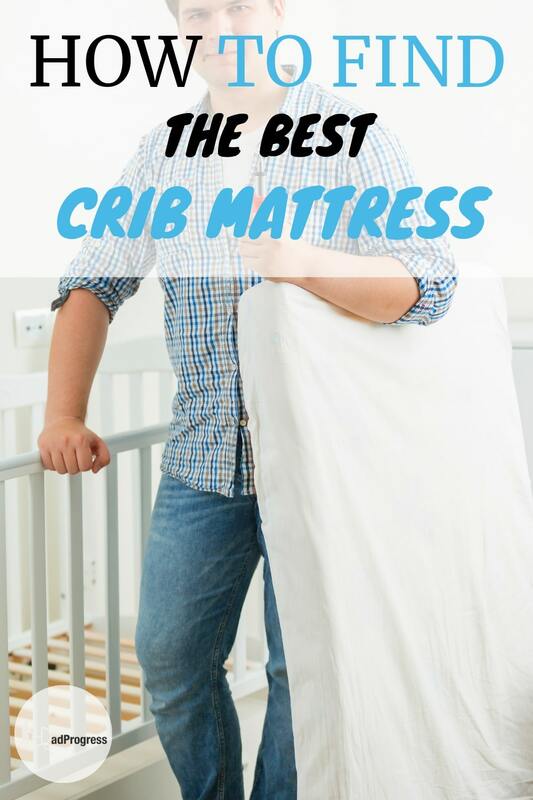 One of the most important tasks is to buy the best crib mattress since that is where your child will spend quite a bit of time. For most dads, the options can be overwhelming though. But no worries! This quick buying guide and five reviews will help to make this process easier. Just keep reading! When you start the process of buying the best crib mattress for your baby, there are a few things you should look for. While you might have a personal preference for things like brands, the biggest priority you want to think about is safety. The first thing you want to look at is the type of the mattress. The two main types are innerspring (or coil) and foam. Either of these is good options as long as you make sure it's high quality. An innerspring mattress has layers and springs on the inside. The more features the mattress has, such as the number of coils and what it's made of, will make the cost increase. So a high-quality innerspring mattress is usually more expensive and heavier than a foam crib mattress. Different layers help it to give better support though. As an addition, an innerspring crib mattress is generally very durable. 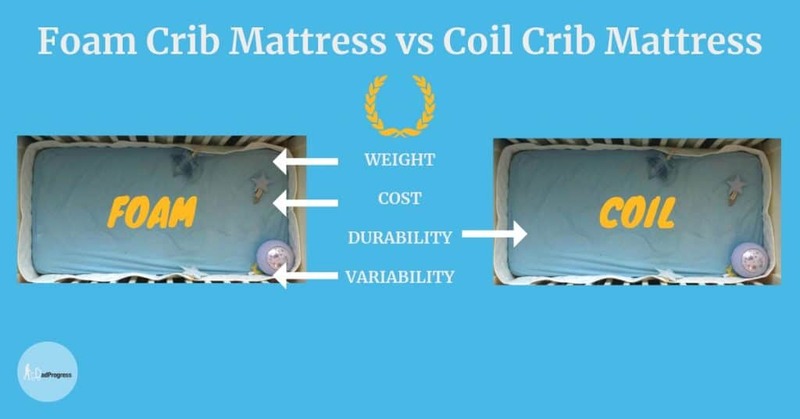 A foam crib mattress doesn't have coils, so it's usually cheaper than an innerspring crib mattress. That said, some foams can be very expensive. For example, the organic Lifekind mattress can cost about ten times more than the cheapest one on the list. Affordable price doesn't make them bad options though. Yes, polyurethane is the most commonly used material, but different foams can have variable properties. As a result, there are more comfort levels available for your infant. And if you wish to buy an organic crib mattress, then a foam mattress is the only option. A foam crib mattress is also more lightweight than a coil mattress. 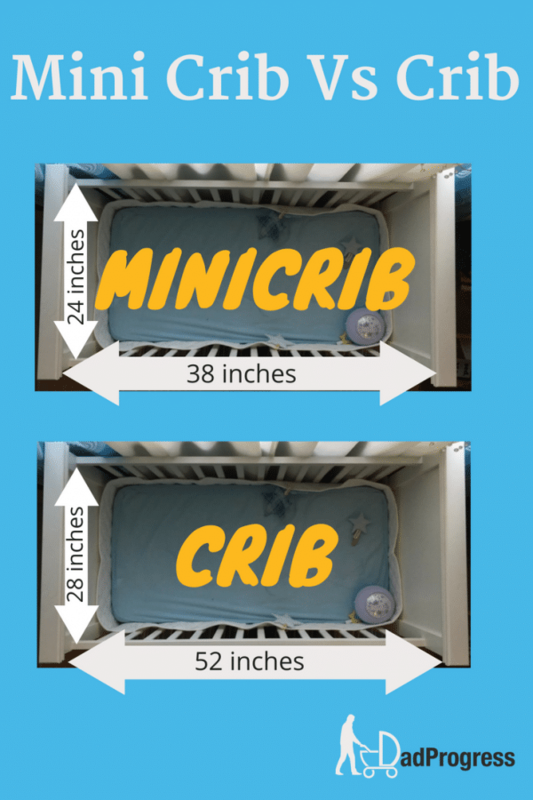 So if you have a foldable mini crib or you for any reason have to move it often, it becomes a better option. A foam crib mattress can be less durable than an innerspring mattress though. The edge support isn't generally that good, but it depends on the product. You'll also want to pay attention to the firmness and density of the mattress. Although you make think that a nice soft mattress is best for your baby, it's actually the other way around. The best crib mattress should be firm and dense for it to be safe. You don't want your baby sleeping on something that can mold to his face or head because it causes a considerable risk of suffocation. As I've mentioned before, foam crib mattresses have more levels of comfort. It means that you run a higher risk of buying too soft a mattress for a baby. When in the store, there are tests you can do to test the firmness and density. For firmness, you want to take your hand and press down on the edges and center. Once you remove your hand, the mattress should bounce right back. For denseness, you want to pick up the mattress, put a hand on each side and press together. A mattress with high density won't let you press in very much. So a waterproof crib mattress can be a saving grace as it's easier to clean. You want to try and find a mattress that is leakproof and does an excellent job at keeping any moisture out. The more expensive models will have multiple layers to help do this. For example, they may have a vinyl or polyethylene surface. Some crib mattresses are designed to be washable at home. If you still aren't sure about how well it does, you can always buy a waterproof cover that is sold separately. Keep in mind, though, the cover should fit snugly, so there is less chance of your baby getting caught up. Another thing to look for is the size of the mattress. If you have a standard crib, then it's very straightforward. The mattress should be about 28 x 52 inches (~71 cm x ~133 cm) because inner dimensions of a crib are regulated by law. The minimum size is 27 1/4” x 51 5/8” . A crib mattress should not be thicker than 6“ because otherwise it may enable your toddler to climb out of the crib. If you have a mini crib, then the suitable mattress is usually 24 x 38 inches (61 cm x 96,5 cm). Why I'm saying "usually?" The dimensions of non-standard cribs aren't strictly regulated. So it's worth double checking the inner dimensions of your mini crib before making the actual buy. There are also some things you want to stay away from. These will help ensure that you're getting the best mattress and your child will be as safe as possible! The last thing you want is to do one of these things and have something happen. Even though buying items for a new baby can get expensive, you shouldn't try to cut costs by buying a used mattress. I can't recommend purchasing even ones that are advertised as only being used for a short time. There are a few reasons why used mattresses should be avoided. For starters, you never know whether the mattress is sanitary. It could have anything from fleas to bed bugs! You want to make sure you buy a mattress that's made for babies and not one that's made for toddlers or older children. These have extra padding for more comfort and are extremely unsafe for babies. As I've already mentioned (sorry for repeating myself), a proper crib mattress is firmer and denser than a toddler mattress. You may want to buy something softer and more comfortable for your older child. That said, our toddler still happily sleeps on a firm baby crib mattress. I have no intention to buy a softer mattress before he's ready for a bigger toddler bed. There are also crib mattresses that grow with your child. They have different firmness on each side. One side of the mattress is meant for babies, and when the time comes, you just flip it over. As it happens, I didn't know that at the time of the purchase. What's A Breathable Crib Mattress? Breathable materials allow air to move more freely between the layers of the mattress. So intuitively a breathable mattress seems to be the best option. And indeed, companies market breathable crib mattresses to be safer. The idea behind it that the exhaled air (CO2) of your infant disappears more quickly. Sadly, there aren't any scientific papers to support that claim. If you happen to know any, please let me know. As an addition, a breathable crib mattress usually costs more and is harder to clean. TIP: Always put your baby sleep on his or her back and don't leave pillows or blankets in the crib. If you think that it's too cold for your baby, dress him or her in footed pajamas. What's A Hypoallergenic Crib Mattress? "Hypoallergenic" isn’t an official medical term. It was first used in 1953 in a cosmetic campaign. Consumers take it to mean it’s safe, but no one regulates the word. Hypoallergenic products claim to use less known allergens. That said, we can develop allergies literally to anything. When companies claim that these mattresses cause less allergic reactions it's hard to argue against it. That said, there's also very little proof. Now that you know what to look for and what to avoid when buying a safe crib mattress, we can move onto the crib mattress reviews! Not only is the Newton baby crib mattress mattress non-toxic, but it's also "hypoallergenic." It's also made of breathable material which may be safer in case your baby rolls over at night. If you're like me, you'll appreciate the fact that this mattress is completely washable. Even if you forgot to use that mattress pad, you could easily clean this mattress in case of an accident. This isn't a coil mattress as it has no springs. It's made in the U.S. This "hypoallergenic" foam crib mattress has an outside encasement that is entirely waterproof. The bottom is made from a flame-resistant material that lets air and heat circulate through the mattress. Even though the mattress forms to your baby's curves, it doesn't get distorted or form any indentations. Another great option is the Colgate Eco Classica III. This "hypoallergenic" foam mattress is free from toxins and harmful materials, and the cover is waterproof. It has two firmness options, which means it can be used for your baby and your toddler. The baby side is made from firm foam, while the toddler side is made from more plush and fluffy foam. Even with that being the case, the mattress is flat, and you don't have to worry about it being uneven, or your child rolling. This crib mattress uses organic materials like organic cotton to make the cover. That said, it isn't an organic mattress as many materials used (e.g., polyurethane) aren't organic. If you're looking for a coil crib mattress, then this product may be for you. 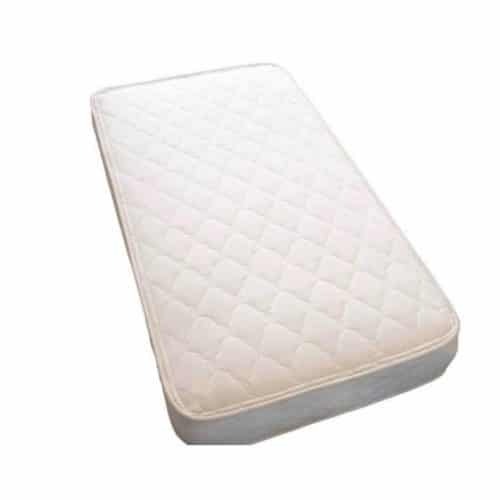 The mattress is provided with a super-firm 150-coil innerspring. It's also an organic crib mattress as it uses GOTS certified cotton for the cover and has an organic coconut pad. If you're looking for an organic crib mattress, then this product is for you. It uses natural organic rubber, and the cover is made of GOTS-certified organic wool and cotton. It fits snugly in the crib without producing any gaps, and a standard sized fitted crib sheet fits perfectly. Overall, the best crib mattress on this list may be the one by Newton (check the latest price on Amazon). It's a safe lightweight crib mattress that's easy to clean. If you're looking for a great cheap crib mattress, then the best option is probably the Milliard Mattress (check the latest price on Amazon). ​Lifekind Certified Organic Crib Mattress is for parents who need to have an organic crib mattress, but it comes with a price tag. A viable option is to buy an organic coil mattress by My Green Mattress, but some parents have complained about the smell. If you wish to buy a crib mattress that grows with your child, then check out the Colgate Eco Classica III (latest price on Amazon). It also ticks all the boxes. All the reviewed crib mattresses meet the essential safety standards and can be best for your baby. Take a look around and decide which of them fits your criteria.